Well, finally, that time of the week has arrived when we bring a wrap up ‘Top Newsmakers Of The Week’ from the South Industry. 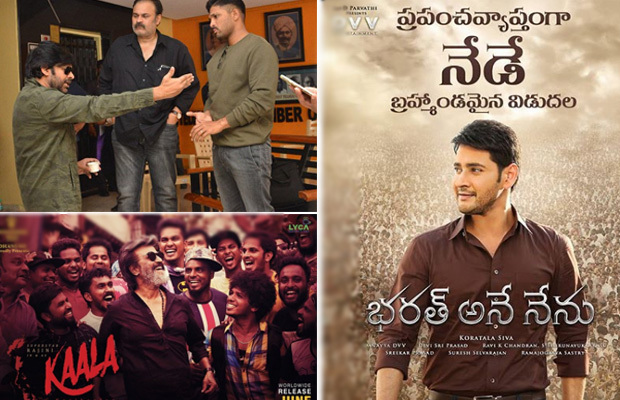 Mahesh Babu starrer Bharat Ane Nenu Box Office: Superstar Mahesh Babu is a delighted man after his recent outing Bharat Ane Nenu has been doing exceptional business across the globe. The film which released on Friday emerged as the fastest Rs 100 crores grosser in Tollywood (excluding Baahubali franchise). Bharat Ane Nenu has been running with packed houses and the huge positive word of mouth turned out to be a huge advantage for the film. The film even crossed 2 million USD in the USA with utmost ease. With the film gaining strength each day, trade analysts predict that Bharat Ane Nenu will emerge as the all-time Tollywood blockbuster and is predicted to stand next to Baahubali in its final run. Ileana D’Cruz reacts to pregnancy rumours: Ileana D’Cruz’ recent picture in all-black raised curiosity among the fans and everyone to know if the actress is expecting her first child. Social media users flooded with messages asking if she was expecting after fans supposedly spotted a baby bump. However, Ileana took to Instagram to refute reports that she was in the family way. She shared two pictures of herself clicked by Andrew to clear the air. One was captioned, “Inhale the good sh*t. Exhale the bullsh*t,” while the other was more direct – “#notpregnant”. Rajinikanth’s Kaala release postponed: After much speculation on the release date of the big film, Kaala, producer of Kaala, has finally confirmed the release date for this gangster drama. Dhanush took to Twitter and confirmed that Kaala will release on June 7th, 2018 worldwide in all languages and not on April 27th, 2018 as per the previous schedule. This announcement comes after the strike by the Tamil cinema producers was called off by the producers’ council. Mooga Manasulu song from Mahanati: The makers released the first single from Mahanati titled Mooga Manasulu. It’s a mesmerising romantic number between Keerthy Suresh and Dulquer Salmaan. The music of the film is composed by Mickey J Meyer. The song is sung by Shreya Ghoshal and Anurag Kulkarni. Pawan Kalyan breaks silence on Sri Reddy and Ram Gopal Varma’s abusive rant: While Sri Reddy abused thr power star in front of the cameras, Ram Gopal Varma admitted that he instigated Sri Reddy to abuse Pawan Kalyan to grown into a bigger force. However, a couple of days later, Pawan Kalyan broke silence over the same. In a series of tweets, Pawan Kalyan touched upon many things. Pawan Kalyan quoted all his tweets – “If I cannot defend the honour of my mother I better die” – referring to the abuse Sri Reddy had against him.